The farm animals that get to spend their time living at Alaqua Animal Refuge mainly come from previous owners who no longer want them and in most cases become neglected pets. 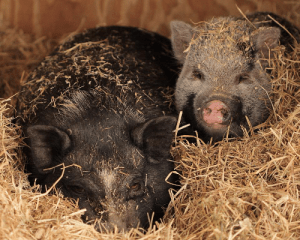 Unfortunately many owners obtain farm animals as babies and then once they grow up they no longer consider them to be a family member worth keeping. Once they cross through the gates of Alaqua they instantly become a family member to all of the animals and staff. Their average medical and feed expense averages to about $25 a month. Your one time or monthly recurring donation of $25 can help sponsor a once unwanted farm animal become a beloved member to an entire Refuge.